The fire took hold in the roof space of the Fair Isle Bird Observatory before completely destroying the building. A crowdfunder launched to help a young family who lost their home in a fire that destroyed an internationally renowned research centre has been wound up after it saw a “phenomenal” £26,000 raised in just a few days. The observatory on Fair Isle in Shetland was known for its work on seabirds and bird migration patterns. The Fair Isle Bird Observatory team was headed by warden David Parnaby and his wife Susannah, who was the centre’s administrator. They have lived on Fair Isle with their children Grace and Freyja since February 2011. A crowdfunder was launched last Monday to support them after the devastating fire the day before. The funder was created by the Fair Isle community with an initial £2000 target. More than 860 people have donated £26,460. But in an update it said:”This fundraiser for the Parnaby Family has raised far more than we had ever imagined it would. We have therefore decided to end this GoFundMe campaign. “Thank you so very much to everyone who has donated – the generosity of the public has been phenomenal and the family are very grateful for your support. 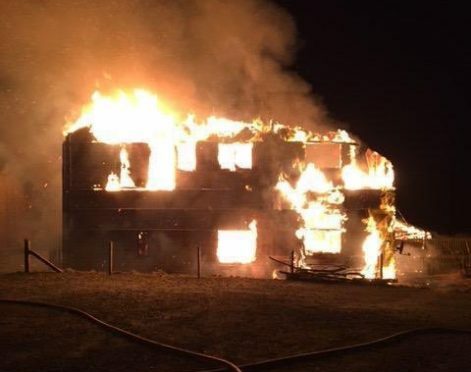 The funder added at its launch:”On the 10th March 2019 our friends, the Parnaby family, lost their home and life’s possessions in the catastrophic fire that destroyed Fair Isle Bird Observatory. “We have set up this fund to raise the money required to help them replace the essentials of family life. Everything from clothing, bedding and kitchen utensils to furniture, TV and toys. Hundreds of visitors a year are attracted to the remote Shetland isle, which is owned by the National Trust for Scotland, and which usually has a population of around 60 people. Roy Dennis, honorary president of the observatory, has vowed to rebuild the £4m facility that opened nine years ago.